"In the year-and-a-half since the Black Pharaoh replaced the Oval Office with a literal blood fountain throne, I’ve watched as the hits keep on coming. The executive cabinet is wracked with scandal, ordinary citizens who signed the cultist oath are making good on their grave pacts, and, of course, the entirety of the country’s water supply is now teeming with pulsating eggs from some kind inter-dimensional parasite. It’s easy to look at these kinds of headlines, to read these sorts of leaked stories from the desiccated Capitol Hill, and see an unsustainable administration. Rumors of reversal incantations are beginning to make the rounds, and if our Commander-in-Chief is not careful, It could find Itself cast back among the stars beyond the universe. The past few weeks, in particular, have seen our President certainly live up to our campaign slogan 'I See All, and It Shall Burn.'" "But it’s important Americans know there are still some of us upholding the tenets envisioned by the original Necro-Party. We are part of a different kind of Resistance, one that still supports the foundations scrawled within the Tome of Infernal Torment, and not the whims of a Mad Anti-God who cares not for the literalist interpretations we hold so blasphemous. We believe the Tome is, was, and will forever be instrumental in wresting reason from the minds of the multitude. It may provide faint solace, but we felt we owe it to our fellow subjugates to let them know all is still very much for naught." 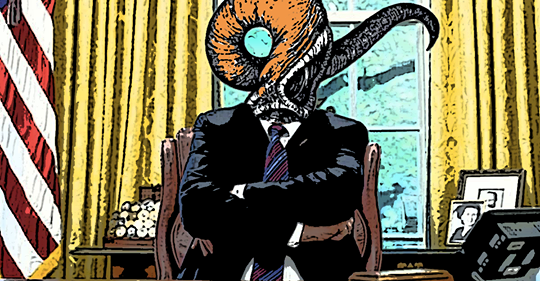 "We still believe utter ruin can be brought to the land through the proper rituals and unhallowed traditions, not by this fly-by-the-seat-of-your-tentacles kind of governing." From: "I am Part of the Resistance Inside Nyarlathotep's Death Cult" by Andrew Paul at McSweeney's.